With the temperatures set to soar in the UK this week, the nation’s drivers are being warned that driving in hot weather can affect our driving skills. The biggest danger to our driving ability in hot cars is the threat of dehydration, with experts warning that not drinking enough water can have same impact on driving ability as being over the drug and drink drive limit. Researchers at Loughborough University have found that the number of dangerous driving incidents more than doubled when they tested dehydrated male drivers in a simulator. Ron Maughan, professor of Sport and Exercise Nutrition at the university and chair of the European Hydration Institute Science Advisory Board, said: 'We all deplore drink driving, but we don't usually think about the effects of other things that affect our driving skills, and one of those is not drinking and dehydration. 'There is no question that driving while under the influence of drink or drugs increases the risk of accidents, but our findings highlight an unrecognised danger and suggest that drivers should be encouraged to make sure they are properly hydrated. 'To put our results into perspective, the levels of driver errors we found are of a similar magnitude to those found in people with a blood alcohol content of 0.08 per cent, the current UK legal driving limit. 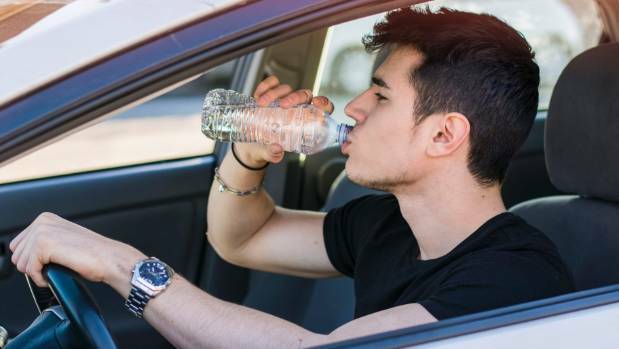 The warning comes after separate research found that of 1,000 motorists surveyed, more than two-thirds didn’t recognise the debilitating symptoms of dehydration. One in five drivers drinks less than one litre a day, which is well below the recommended guidelines of two litres per day. Iain Temperton, director of communications at Road Safety GB, said: 'Before you start a journey you should make sure your vehicle is prepared but, just as importantly, you should ensure that you are ready and fit to drive. 'Driving on our ever more congested network is a task that requires full concentration.